Create the culture you want with this revealing and effective assessment and action process. This proven process zeros in on your biggest culture gaps and sets you on course to get your team where you want to go. You will work with experts who will provide actionable guidance on how to embed the cultural values you want and build alignment around a cohesive future direction. To learn more about the Culture Assessment and get a free preview in to the process itself, fill out the form to the right and download the Leadership Guidance & Alignment brochure today. Alternatively, you can call or email us at 312.829.3252 and results@yourthoughtpartner.com. 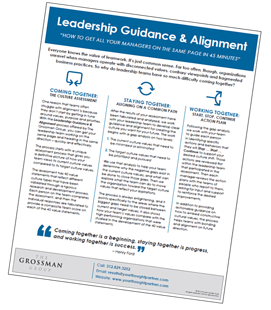 Download the Leadership Guidance & Alignment Brochure to learn more! Phone: 312 .829.3252 | Fax: 312 .829.3255 | 312 N. May St., Suite 101, Chicago, IL 60607 | Copyright © The Grossman Group 2011. All rights reserved.